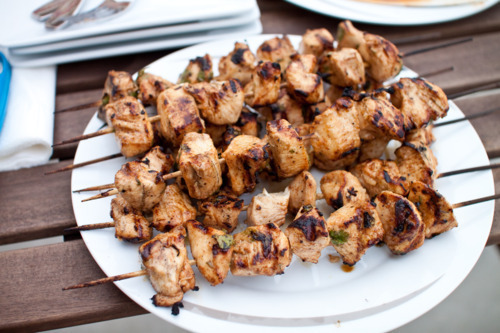 I love cooking with skewers, especially for chicken. Instead of grilling a big piece of chicken breast, cutting them up into smaller chunks gives it more flavor (if you’re using a marinade). It also grills faster and gives you more char per square inch, which mean even more delicious food. For the chicken skewers, I wanted to give it a flavor profile that was refreshing with a kick since we had a heavier main course. I looked online and found inspiration from a Chili-Lime recipe. It was a good start, but then decided to make some modifications to my liking. The flavor profile of the marinade is delicious. The marinade features two contrasting flavors that balance each other. The primary flavor is the spice from the chili pepper and minced garlic. The secondary flavor is the citrus sweetness from the lime and pineapple juice. The acidity from the citrus and the punch of the cilantro tempers the heat from the spice. 1 pound skinless, boneless chicken breast halves – cut into 1 ½ inch pieces. In a small bowl, mix together the olive oil, vinegar, pineapple juice, and lime juice. Season with chili powder, chipotle powder, paprika, minced garlic, salt, and black pepper. Place the chicken in a shallow baking dish with the sauce, and stir to coat. 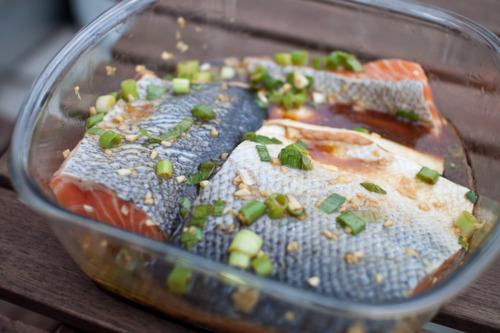 Cover, and marinate in the refrigerator at least 1 hour. Lightly oil the grill grate. Grill skewers for 10 to 15 minutes, or until the chicken juices run clear. Turn every few minutes to give an even char. A few years ago, this farm-to-table restaurant called Founding Farmers opened next to the IMF (not badass Ethan Hunt, but maid-chaser Dominique Strauss-Kahn). I went there countless times because the menu was so delicious and the drinks were to die for. In fact, I probably brought every out-of-towner to Founding Farmers. One of my favorite items was the Cedar Planked Salmon. Growing up, I was fairly apathetic to salmon. My take on salmon was either that it was either an oozing-white over-dried buffet item or a soy-marinated baked fish that my mom made now and then. Founding Farmer’s version was different. Everything they used there was organic or locally grown, and somehow it made everything taste so much better. 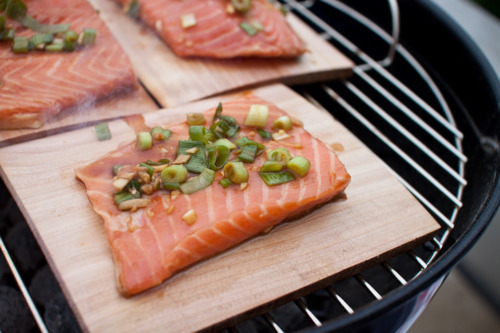 So they started with some wild-caught atlantic salmon, marinate it in a maple syrup-apricot glaze, then smoke/grill it on a cedar plank. 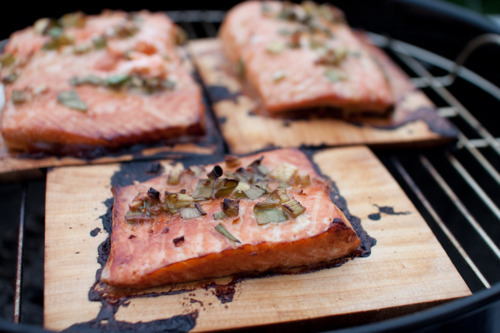 The cedar flavor infuses the salmon during the cooking process to balance out the sweetness of the glaze. It is so freakishly good. Because of that inspiration, Jess and I decided to try make it for some guests. They key would be cedar planks and the grilling process that releases its flavors. We got our planks from Amazon (where we get everything). Make sure you get untreated cedar wood, otherwise you’ll be eating chemicals. So after very-excited receiving our planks in the mail, we ran to the market to pick a few basic ingredients, per the recipe that we found. The recipe we followed is really simple – just soak the planks, create a simple marinade with basic ingredients, marinade, and then grill. You could probably do this in the oven, but the cedar flavors would not be as strong. Anyways, here’s the Cedar Planked Salmon recipe that we followed. It a smashing success, and our guests loved it. The deliciousness of our previous Grilled Truffle Shrimp Skewers inspired us to look for similar recipes. 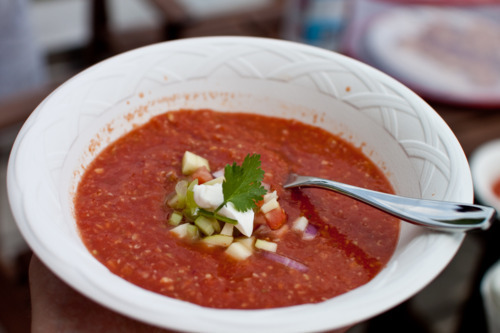 Rob loves spicy food and Jess loves Mark Bittman’s recipes – they are simple yet oh-so-tasty. Tip: Our wood skewers from last week started molding! Be sure they are dry before you store them. Try to get bamboo ones too. We found one from him called Skewered Spicy Shrimp and modified it to make it a tad more suited to the dishes we were cooking today. Our party guests loved it. It’s a totally different taste and texture from our Grilled Truffled Shrimp – very savory with a spicy kick. I’d recommend eating it with a cold beer. 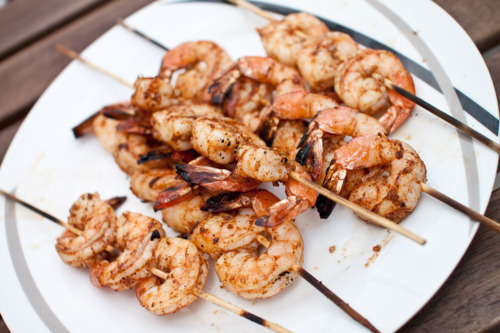 Rinse shrimp – it gets rid of some of the undesirable “sea” flavors. Mix garlic, sea salt, chipotle pepper, adobo chipotle sauce, paprika, olive oil, and lemon juice together in a large bowl to make a liquidy paste. Mix this sauce with cleaned shrimp. Skewer shrimp – about 6 per stick. Fire up the grill to at least medium-high heat. Grill each side for about 3-4 minutes. Turn when tails turn orange/red. Serve with lemon wedges.